It’s summer. It’s hot. You need a drink that’s cold, refreshing, and very alcoholic. Grab a watermelon, a coat hanger, a drill, and a bottle of your favorite vodka and be prepared to absolutely crush all the other offerings at the barbecue. 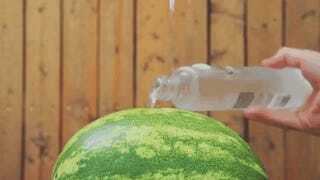 Thanks to our friends at Lifehacker, you now know how to make an alcoholic watermelon slushy that comes neatly packaged in its own rind. Use the drill to drill a small hole in the top of the watermelon. Snap off a piece of wire hanger and bend it into the shape shown. Attach it to the drill. Push the wire hanger inside the watermelon and power on the drill to scramble up the flesh inside. Pour a bottle of vodka through the hole (a funnel might help if your hole is small). Put it in the fridge to cool it—even better, give it 15 minutes in the freezer just before serving. Cut the hole into a spout. Feel free to improvise. Me, I’m a gin girl, so I’d swap the vodka for a bottle of Hendrick’s gin and pour in a cup of freshly squeezed lemon or lime juice as well. And garnish with fresh sprigs of mint, of course. Check out the rest of Lifehacker’s delightful video tips.